Used to show all Articles that have been published to the Front Page, in a Blog Layout. A Blog Layout in Joomla! has 3 main areas: Leading, Intro, and Links. These are shown in the diagram below. Articles in the Leading Area always display in one column, using the full display width. 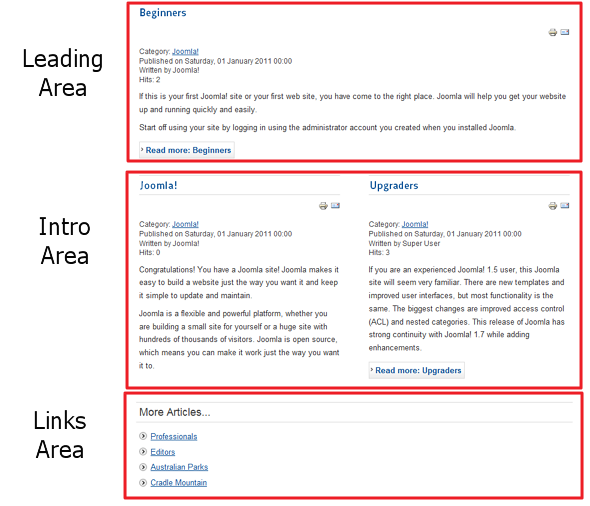 Articles in the Intro Area may display in one, two, or three columns, depending on the Columns setting. The parameters below control the number of Articles in each area and the order in which they display. If an Article has a "Read more..." break, only the text before the break (called the Intro Text) will display, along with a "Read more..." link. Parameters - Basic The Front Page Blog Layout has the following Basic Parameters, as shown below. # Leading. Number of Articles to show using the full width of the main display area. "0" means that no Articles will show when using the full width. If an Article has a "Read more..." break, only the part of the text before the break (the Intro text) will display. # Intro. Determines the number of Articles to display after the leading Article. These Articles will display in the number of columns set in the Columns parameter below. If an Article has a "Read more..." break, only the text before the break (Intro text) will display, followed by a "Read more..." link. The order order in which to display the articles is determined by the Primary Order parameter in the Parameters - Advanced section below. Columns. The number of columns to use in the Intro Text area. This is normally between 1 and 3. If 1 is used, the Into Text Articles will display using the full width of the display area, just like the Leading Articles. # Links. The number of Links to display in the 'Links' area of the page. These links allow a User to link to additional Articles, if there are more Articles than can fit on the first page of the Blog Layout. Parameters - Advanced The Category Blog Layout has the following Advanced Parameters, as shown below. Category Order. Order of Categories in this Layout. The following options are available. No. Order by Primary Order Only: Articles are ordered only by the Primary Order, without regard to Category. Order: Categories are ordered according to the Order column entered in the Category Manager. Primary Order. Order of Articles within a Category. The following options are available. Default: Same as Most Recent First. Articles are displayed starting with the most recent and ending with the oldest. Oldest first: Articles are displayed starting with the oldest and ending with the most recent. Most recent first: Articles are displayed starting with the most recent and ending with the oldest. 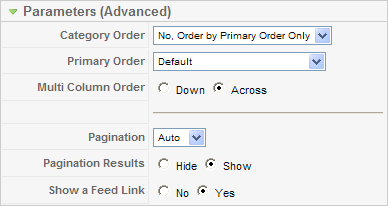 Order: Articles are ordered according to the Order column entered in the Article Manager. Multi Column Order. In multi-column blog layouts, whether to order articles Down the columns or Across the columns. Show a Feed Link. Hide or Show an RSS Feed Link. (A Feed Link will show up as a feed icon in the address bar of most modern browsers). This page was last modified on 13 July 2010, at 09:46.